Flashy Gulfstream Park debut winner Hidden Scroll and Game Winner's undefeated stablemate Improbable were close behind in the betting at 7-1, respectively. 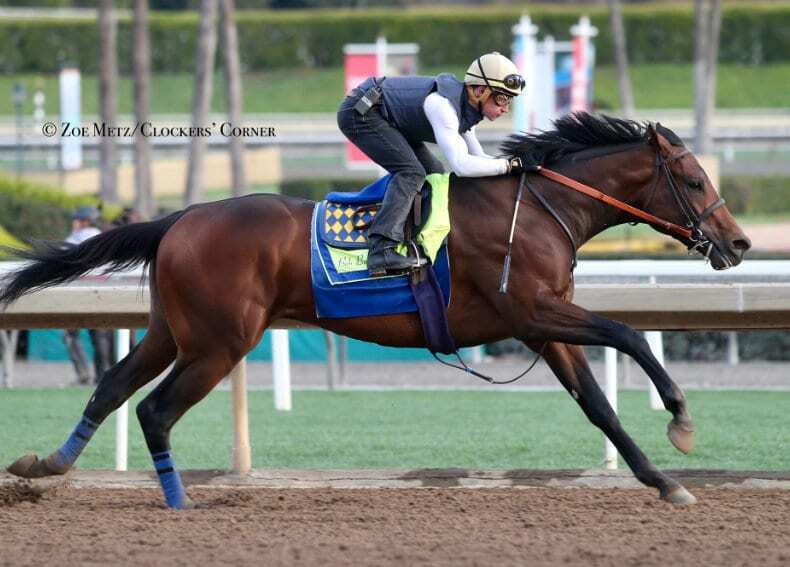 Both Game Winner, victorious in the Breeders' Cup Juvenile (Grade I) at Churchill Downs, and Improbable, winner of the Los Alamitos Futurity (GI), are trained by Hall of Famer and five-time Kentucky Derby-winner Bob Baffert and expected to make their 3-year-old debuts in March. Hidden Scroll, a candidate for the March 2 Fountain of Youth (GII), is conditioned by Hall of Fame trainer Bill Mott, who seeks his first Derby win. Other horses that attracted the most interest from bettors were unbeaten Best Pal (GII) winner Instagrand (10-1) and Lecomte (GIII) winner War of Will (17-1), who returns as the headliner in Saturday's Risen Star (GII) at Fair Grounds. Horses in order of favoritism (with trainer, Pool 2 Odds and $2 Win Will Pays): #24 “All Other 3-Year-Olds” (5-2, $7.60); #3 Game Winner (Baffert, 5-1, $13.40); #8 Hidden Scroll (Mott, 7-1, $17.60); #9 Improbable (Baffert, 7-1, $17.60); #10 Instagrand (Jerry Hollendorfer, 10-1, $22.60); #22 War of Will (Mark Casse, 17-1, $36.80); #2 Coliseum (Baffert, 22-1, $46.20); #4 Global Campaign (Stanley Hough, 22-1, $47.80); #14 Mucho Gusto (Baffert, 23-1, $48.20); #7 Harvey Wallbanger (Kenny McPeek, 28-1, $58); #17 Signalman (McPeek, 28-1, $59.20); #1 Bourbon War (Mark Hennig, 31-1, $64.80); #6 Gunmetal Gray (Hollendorfer, 34-1, $71.60); #23 Win Win Win (Mike Trombetta, 35-1, $72.60); #13 Maximus Mischief (Butch Reid, 38-1, $78); #15 Network Effect (Chad Brown, 40-1, $83.60); #20 Vekoma (George Weaver, 41-1, $84); #12 Limonite (Steve Asmussen, 60-1, $122); #19 Tax (Danny Gargan, 63-1, $128.60); #11 Knicks Go (Ben Colebrook, 78-1, $158.20); #18 Tacitus (Mott, 96-1, $194); #5 Gray Attempt (Jinks Fires, 104-1, $211.20); #16 Owendale (Brad Cox, 111-1, $225.20); and #21 Walking Thunder (Ahmad bin Harmash, 118-1, $239.80). The pari-mutuel field for the first pool of the New Year has closed as the bettors' choice every year since the wager was inaugurated in 1999, and the final odds have been 5-2 each of the last five years. Total handle for the Feb. 8-10 KDFW pool – the second of four wagering pools in advance of the 145th running of the $3 million Kentucky Derby Presented by Woodford Reserve (GI) on Saturday, May 4 – was $533,977 ($398,997 in the Win pool and $134,980 in Exactas), which was up 2.4% from last year's $521,650 ($363,389 in the Win pool and a record $158,262 in Exactas). Betting on Pool 1 of the KDFW on Nov. 22-25 was $258,389. “All Other 3-Year-Old Colts and Geldings” closed as the 6-5 favorite with Game Winner at 5-1. The KDFW has been offered for a 21st consecutive year. Dates for the remaining 2019 future pools are March 8-10 (Pool 3) and April 5-7 (Pool 4). The lone Kentucky Oaks Future Wager will coincide with Pool 3 of the Kentucky Derby Future Wager on March 8-10. Visit www.KentuckyDerby.com/FutureWager for more information. This entry was posted in Horseplayers, NL Article and tagged game winner, hidden scroll, improbable, instagrand, KDFW, kentucky derby, kentucky derby future wager, war of will by Press Release. Bookmark the permalink.